The laws and principles that exist to enforce the principle of net neutrality are complex and much debated. 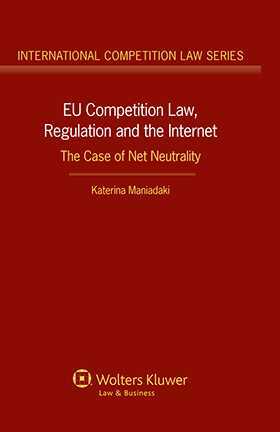 This new book by Katerina Maniadaki presents a thorough analysis of EU Competition Law as a tool to protect net neutrality. Bringing clarity to the debate, EU Competition Law, Regulation and the Internet. The Case of Net Neutrality, clearly outlines the definition, principles and objectives of net neutrality, helping the reader to gain a full understanding of this complicated subject. Examining the EU Regulatory Framework, Katerina Maniadaki discusses critically the standards set by the existing case law; introduces a framework for the relevant market definition, assessment of market power and analysis of practices in markets where net neutrality violations could manifest. Practitioners, policymakers, and academics in a number of fields will greatly appreciate the depth with which this study tests the assumption that competition law can address the issues raised by net neutrality, and to what extent. The analysis focuses on the case law of the CoJ, Commission decisions, and soft-law instruments, and also attends to relevant policy documents, including work by BEREC. EU Competition Law, Regulation and the Internet. The Case of Net Neutrality contains a full bibliography to support further research. EU Competition Law, Regulation and the Internet. The Case of Net Neutrality brings clarity and comprehension to the important area of net neutrality. Katerina Maniadaki’s considered approach of the role of EU Competition Law provides essential guidance to the assumption that competition law can address these issues and to what extent. Chapter 2 Net Neutrality: Definition, Principles and Objectives. Chapter 3 Net Neutrality Regulation in the EU. Chapter 4 The Inherent Potential and Limitations of Competition Law in Protecting Net Neutrality. Chapter 5 Relevant Market Definition and Assessment of Market Power. Chapter 6 Net Neutrality Violations as Refusals to Deal. Chapter 7 Net Neutrality, Discrimination and Unfair Pricing. Chapter 8 Extensions and Conclusions. Bibliography and Tables of Cases and Material. Decisions of the European Commission under the Competition Rules. Judgments of the Court of Justice of the European Union. Judgments of the General Court. Comment Letters and Decisions of the European Commission under Article 7 of the Framework Directive. Notices, Recommendations, Communications, Guidance, Guidelines,White Papers, Reports and Staff Working Documents of the European Commission. Declarations and Reports by EU Institutions. Decisions, Declarations, Reports by BEREC and National Authorities.